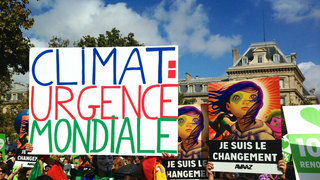 Greenpeace: Climate Justice Movement Must Intensify Efforts Ahead of 2011 Climate Talks in South Africa | Democracy Now! AMY GOODMAN: While the climate talks are reaching a critical stage, many delegates have already started looking towards the 2011 climate summit scheduled to take place in Durban, South Africa. Democracy Now! 's Mike Burke spoke with one of the leading South African climate campaigners — he's speaking every day here in Cancún — Kumi Naidoo of Greenpeace International. KUMI NAIDOO: My name is Kumi Naidoo. I’m the executive director of Greenpeace International and the chair of the board of the Global Campaign for Climate Action, which is a global coalition of civil society, known by the tcktcktck.org name. And we are here because we want to try to see if we can recover the momentum that was lost at Copenhagen and to inject some urgency into these negotiations, which we feel can best be described as this negotiation process is playing catch-up. It’s way behind where we need to be. It does not reflect the urgency of where we need to be. And certainly, what comes out of this will be a very clear signal of what campaigners will need to do to create any serious possibility of securing a fair, ambitious and legally binding climate treaty. MIKE BURKE: And what are the key issues that you’re looking at this week? KUMI NAIDOO: Well, firstly, in terms of the responsibilities of developed countries, we want to see a second commitment period of the Kyoto Protocol agreed. We are concerned that Japan, in particular, and a few other countries are hiding behind Japan, like Canada, New Zealand, Australia and Russia — we want to ensure that there is a commitment to move forward with a second commitment period on the Kyoto Protocol. If we fail to get that, basically we are in a real mess, because we would not be able to then move the developing countries, and particularly the big emerging developing countries. Secondly, we want to see movement on targets. You know, words here matter a lot. The earlier drafts on the percent — the degree of temperature rise said as far below two degrees as possible. And now it just says two degrees, because essentially the science is telling us that even a one-and-a-half-degree rise in global temperature will mean devastation for small island states, for Bangladesh and so on. So, basically, we’re trying to get along a stronger language both on the ambition of where we cap global temperature rise, as well as in terms of emissions targets by 2020. The third big issue for us is finance. In Copenhagen, it was agreed that we would have fast-track finance to help developing countries. And unfortunately, even though the word “fast” in every language means quick, urgent, immediate, we have not seen in 12 months that urgency to actually ensure that money gets to where it needs to get. And if we do not help developing countries with the resources to adapt and mitigate, we exacerbate the reality of the people who are being impacted. And the injustice of that is overwhelming, in the sense that the people who are paying the first and most brutal price are the ones that have been least responsible for emissions and for the chaos that we’re in, but also in terms of self-interest on the part of developed countries. We need to ensure that developing countries don’t follow the same dirty energy path of development that rich countries did, because if we allow that, in 10 years’ time probably developing countries’ emissions would way exceed those of developed countries. But the big prize in all of this is still a fair, ambitious and legally binding treaty. And what we would like to see evidence of is a road map from how we get from Cancún to Durban, where the next COP will take place, with a serious possibility that we can get a binding deal. MIKE BURKE: If you had a chance to meet with the U.S. delegation, what message would you send to them? KUMI NAIDOO: The message we’d send to the U.S. delegation is that we have to realize that we either get this right, as rich and poor countries acting together, and we secure the future of our children and grandchildren — if we get it wrong, ultimately we all go down together. Yes, the U.S. might go down after Bangladesh and some small island states, but in the end, it’s in the self-interest of the U.S. government, and certainly it’s in the interest of the American people, that they join the party. Essentially, I think to offer a three percent reduction target by 2020 has just kind of overall lowered the ambition, and the fact that it is in the climate bill is of grave concern. But also, the U.S. government needs to understand, and elements within the U.S. government does understand, that they are losing ground. Basically, forget about the space race. Forget about this arms race. The only race that’s going to matter over the next two decades is going to be the green race. And right now, the U.S. is slipping back. In the first quarter of this year, China exceeded the whole world, including the United States, in investment in renewable strategies in the first quarter of 2010. And essentially what you’re going to see is China — if the U.S. continues to have this foot-dragging policy, then China will turn investment into renewable technologies and renewable energy, more generally, as another huge intervention to boost its growing economic independence and will surpass the U.S. sooner as the largest global economy in the global environment. MIKE BURKE: The COP17 will be in Durban, South Africa next year. And what does this mean for South Africa? KUMI NAIDOO: Well, you know, people say that we might be able to get a fair, just, ambitious and binding climate treaty in Durban, but then they say it all depends on whether the dynamic in the U.S. will shift. And one of the things that we are going to be doing is intensifying our mobilization, broadening our base. I’ve just addressed now a gathering of parliamentarians, where I proposed a sort of grand global strategic alliance, where parliamentarians, local governments and civil society, trade unions, NGOs, trade unions, nonprofit groups, come together to actually work over the next 12 years — 12 months to ensure that by the time we get to Durban, we have a realistic chance of actually winning this. AMY GOODMAN: Kumi Naidoo, executive director of Greenpeace International. You can see our comprehensive coverage of the Cancún climate summit on our website, democracynow.org, including the plenary speech of the head of the delegation from Tuvalu, one of the nations of the world on the frontlines of climate disruption.